No beating around the bush here... An RC helicopter simulator is a powerful tool to help you learn to fly your RC helicopter. I personally don’t care if the graphics are to die for and the models look 100% real – if they don’t behave almost 100% real and are controlled real, they won't teach you the necessary skills (stick movements in relation to aircraft response). If you don’t get real physics and real control, you have nothing more than a video game. Sure it may still be entertaining, but it won’t teach you how to fly. So if you want to be entertained, any free RC helicopter simulator will do, if you want to learn to fly – keep reading. Let’s look at control first because it is cut and dry. If you are trying to learn to fly an RC helicopter or airplane with a game-pad, joystick, or on your keyboard – you are wasting your time. The only way to learn to fly with an RC helicopter simulator is by using a real (or at least gutted out) RC transmitter/radio. The main reason for this is anytime we are learning a new task, we build new pathways in our brains to control our motor functions (more commonly called "muscle memory"). 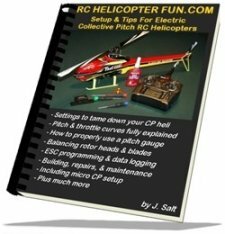 In the case of learning to fly an RC helicopter, this relates to ultra fine control of our thumbs &/or forefingers, and thus we need to use the exact same controls we would in real life if we want to learn these necessary skills. The good RC helicopter simulator programs come with either a gutted out USB adapted RC transmitter that plugs into a USB port on your computer, or comes with a USB/DIN converter cable to plug directly into your own quality RC transmitter via the trainer input port. My prediction with more and more radio's using "wireless" training connectivity & Bluetooth programming, there will also be a growing number of wireless RC simulator connectivity options as well in the near future, so keep an eye out for that. Flight physics are a little more subjective. I'm primarily looking at helicopter flight. After reading many reviews, and trying several simulators, the same three (if you want the most realistic RC helicopter flight simulation going) are always head and shoulders above the rest. There is one simulator however that is truly flying higher than all the rest when it comes to the best heli simulation going... The AccuRC RC Flight Simulator. 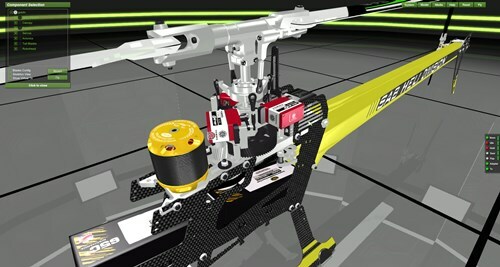 It not only simulates flight physics better then the rest; it also simulates true RC helicopter ownership with component swap-outs, color changes, and seeing the actual functions of the components right down to using a virtual digital pitch gauge to set your collective & cyclic pitch angles while on the "virtual workbench". Plus you can tune the virtual flybarless systems & gyros just like in real life. In fact you can tune just about anything and change the setups just like in real life on both the radio and FBL systems. This is the only simulator I have used to date that realistically replicates real heli setup values. In short, it's super intuitive for people who have RC heli experience or for any of my Setup & Tips eBook customers who want to use the same tame settings I show in the eBook on a sim bird first. As far as I'm concerned, I could just list this single simulator and be done with this entire write-up and you could just skip down to the simulator tips I have listed on the bottom quarter of this page. I've given my other RC helicopter simulators away since getting the AccuRC simulator - it's that superior in my opinion. At around $130.00 USD with free updates to both software and models (downloaded from Accurc's site), it's also a great value. Out of the box it supports FrSky, Spektrum, & JR radios with the 3.5mm training ports. Different cable adapters for different radios are also available at very reasonable costs (all are under $15 bucks). It's also the only RC flight simulator here in the entire list that has a couple RC truck/buggies for track racing simulation as well. I really have no idea why, but it's a fun little bonus! Great Planes RealFlight is certainly highly regarded as one of best simulators on the market. 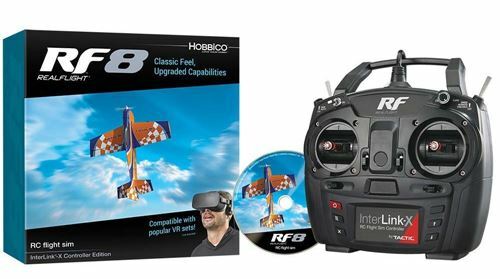 The current RF 8.0 version with USB interlink radio, provides some of the best flight simulation for, helicopters, airplanes, and quadrotors/FPV. Change the weather conditions, simulate radio or engine troubles, and fly with other on-line pilots just like at the real field but this time with the added entertainment of combat flying & racing. Don’t have an instructor to help you fly? No problem, yes there are virtual flight instructors to walk you through the basics up to intermediate level aerobatics. Unfortunately these "virtual instructors" don't come anywhere near to what a real instructor can teach you. They only show what to do, not how or why the aircraft behaves as it does and what to watch out for and what mistakes or situations can manifest resulting in a crash and that's a big missing element. Still, it's better than having no instructor at all. This just scratches the surface. There is just so much this RC helicopter simulator will do. With so many flying environments and different aircraft from electric park fliers to turbine models, this is one simulator you will never out grow. A software only version is also available without the interlink radio. For all you Mac or Linux users, the neXt RC helicopter flight simulator pretty much tops the list. It's also Windows compatible, so this is truly the "multi OS" flight sim of the bunch. The neXt RC flight simulator contains 19 flight sceneries, 63 helicopters, 12 multi-rotors and 2 airplanes, so its true focus is most certainly on helis. More scenes, helicopters and functions will be added in free updates. All v 1.x updates are free of charge. I have never personally used the neXt simulator, but several visitors to my site have contacted me giving it their enthusiastic thumbs up. All said it's pretty decent, and most certainly the best option out there right now for Mac users. Training simulation has something for every skill level. Beginner: The hover flight trainer progressively enables more and more control functions in order to help beginners learn hovering from the four predefined angles. An inverted-flight trainer completes this training program. The switchable autopilot simulates the flight behavior of real helicopters with rescue systems (e.g. BEASTX Microbeast Pro-Edition). Advanced: The Simulator is of course 3D capable. If necessary, the neXt shows the stick movements with four available control assignments. Now you can train blade scratching. Practice auto-rotations and learn the required pitch inputs to perform the maneuver with confidence. The more the energy builds up in the main rotor blades, the more the flight data display turns yellow. Training videos for learning Roll, Turn, Funnel, TicTocs, Piro Flip, Piro Looping, Piro Circle, Piro TicToc, a.s.o. The neXt sim costs around $90.00 USD and is available for download directed from their site. They offer a "free version" as well to test out, however it limits usage time with your RC radio interface to 2 minutes. Heli-X has rich environments, an awesome list of models (including lots of scale & multi rotors), many flying environments, a good tool box of training aids, easy setup parameters, and of course the most important thing - decent good real feel physics. This is a true no nonsense "meat & potatoes" RC helicopter simulator - period! The other great thing with Heli-X is it comes in various versions to work on all systems (Windows, Mac OS-X, and Linux); so it's the other good option here in the heli sim list if you're a Mac user. The one thing to be aware of with Heli-X is it's 100% rotary aircraft specific - no airplanes; so if you want a sim with airplanes as well, stick with RealFlight. Like neXt, Heli-X is downloaded right off their site so the only "hard goods" purchase you need to make is the USB/Radio cable or gutted USB radio. Heli-X has links to several types on their site if you don't already have one (I just use my old RealFlight USB Interlink controller for example). You can first download a "DEMO" version with a limited heli & environment list. This is a nice feature so you can not only try it out to make sure you like it; but also make sure the version you download works with your computer and USB/radio cable/controller. If you decide you like it, you can unlock the full version by purchasing it on Heli-X's site using PayPal; you also get free updates. At 50 euros it's right in line with the others. Here's the link to Heli-X web site for more info on this RC heli simulator. Parting with $100 to $200 hard earned dollars for an RC helicopter/plane simulator may seem a bit excessive, but in the long run will pay for itself, usually many times over. This holds especially true once you start practicing more risky aerobatic maneuvers when crashes are more violent and much more costly in the "real world". 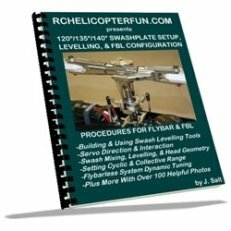 I can’t possibly go over all the different set up features on these RC helicopter flight simulators, but I can give you a few important tips that will make the best use of your RC helicopter flight simulation time. In the options menus, be sure to set the simulation mode to real instead of easy. To learn – “keep it real.” Some sims have training modes that act like virtual autopilot stabilization devices or automatically control one or more control functions so you can focus on just one or two. It might be okay at first for the first flight or two, but the longer you get used to that "virtual help", the harder it will be to give it up. If you never experience that virtual help in the first place, you won't know how much easier it was. My advice is to only fall back on those "easy flying help" features if after several days you are seeing no improvement and you can't even hold a basic tail in hover; use them as a last ditch resort effort. Once you master the tail in hover, go into the weather options and turn on a bit of wind with some light gusts. While you are learning select about 1-2 mph winds with 1-2 mph gusts. This will give a very realistic behaving helicopter that floats and bobs around a bit due to changing translational lift , rotor wash, and ground effect . Even if you only intend to fly your real heli with no wind outside or inside, simulators seem a bit too easy with no wind selected, the helis feel too "locked in". Remember, the harder the simulation the easier the real thing will be. If you are just learning how to fly a RC heli, make sure you select a larger helicopter (550/30 or bigger) with training gear on the landing skids. This is after all what your real RC helicopter will have on it when you are learning. Training gear makes it easier to detect when your helicopter starts to pitch or roll, allowing you to stay one step ahead of what's going on rather than being behind the eight ball. Lastly, training helis are set up to be be more docile (both on the sim and in the real world). This next tip is very important! Don't get too hung up if your specific model of heli is not included on the RC helicopter simulator. You can purchase or download expansion packs of course that may have the specific heli you want, but it won't help you learn to fly any better, especially at the very beginning of the learning stage. Why? In general, if you can fly one single rotor collective pitch bird, you can fly them all - like riding a bike. The true to life physics offered in a good simulator is much more important than if they have the real heli you own or are thinking of purchasing in their data base. Also sim helicopters won't behave the same when setup with docile learning settings, in fact they might not even get off the ground. The sim helicopters with training gear on them (specifically the larger ones) already have been programmed to behave like trainers so that is what you should start on. Trying to tame a non trainer sim heli is met with limited success in other words - perhaps because they were never programmed to behave docile? A sim heli can only fly within the parameters it was programmed to fly in after all. Save your time and sanity - use a bigger collective pitch trainer on the sim and it will behave much more like your real bird that is setup as a trainer. If your RC helicopter simulator has a "slowed down time" feature, you can use it at first when just starting out; but once you get fairly comfortable with the controls, start flying in real time ASAP! Again, the more realistic you make your RC helicopter simulator time, the better off you will be and faster you will learn. 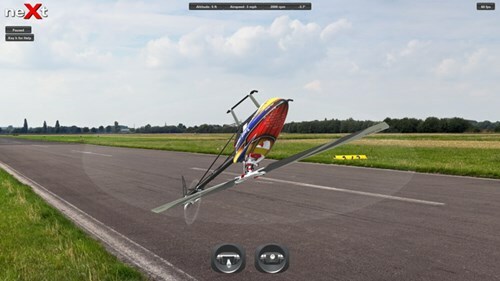 When you are first starting out and learning how to hover on your RC helicopter simulator, it will be very tempting to fly all over the place and start attempting aerobatics right off the bat. This might be fun, but you are not learning much and more than likely developing some pretty bad habits. Concentrate on staying stationary in one spot. 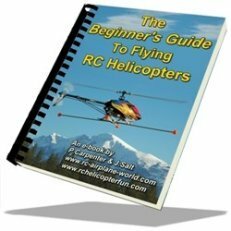 Follow the same steps as I have in my Learning To Fly RC Helicopters section on your simulator or other recognized training program... it will make the best use of your time on your RC helicopter simulator and also enforces what steps you will be doing with your real helicopter as you learn. Speaking of time, don't spend too much time on your RC helicopter simulator in one practice session. About the longest most folks can handle is 30 minutes tops! In fact, 15 minutes may be the most you can handle. This really has nothing to do how long you can sit in front of your computer and just have fun flying around on your RC helicopter simulator; but it has to do with how much new information the processor and memory banks between your ears can process & store in one block of practice time. Learning to fly an RC helicopter requires effort and you are learning so many new hand-eye coordination skills that after 30 minutes, most people are generally not getting anything out of their practice time anymore. Practice often. Even though you should limit your RC heli simulator practice time to 15 - 30 minutes, you can practice a couple times a day to get the most of your sim time and learn skills faster. If for example you skip a week or two when you are just starting to "see the light" with a particular skill you're working on, chances are you'll be almost back at square one again. Practicing often will limit those losses. 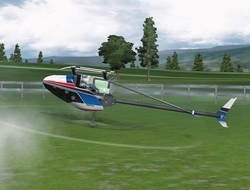 Don't practice only on your RC helicopter simulator after you have mastered the basic tail in hover. Get some time on your real heli as well. No sim will replicate the true feel of hovering. Practicing only on the sim in my opinion becomes a big set back. Yes, get the tail in hovering fundamentals down on your simulator; but as soon as you can hold a solid tail in hover on the RC helicopter simulator, get your tamed down real bird out there so you can learn & experience the "real feel". Once you learn that "real feel" then not experiencing it on the simulator is less important and this is the stage in my opinion when simulator time really starts paying off. Learn a new skill on the sim and then apply that to the real machine - this progression method works well for most people. If you find the noise of the replicated motor/engine drone bothersome (personally, that rhythmic drone becomes torture to my sanity); turn off the sound and listen to your favorite music instead. It helps keep the sanity not to mention helps keep you awake! Lastly have fun with your RC helicopter simulator. Fly planes or multi-rotors too, try it all out.